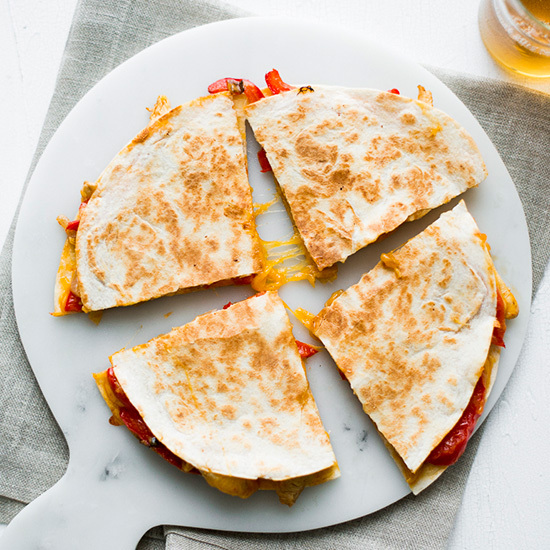 It doesn’t get simpler or better than a warm, deliciously cheesy quesadilla. Here, 21 of the all-time greatest quesadilla recipes F&W has to offer. This quesadilla packs a serious punch, thanks to fiery habañeros. Feel free to dial it up or down. Sweet pineapple pairs perfectly with shredded chicken and gooey cheddar cheese. This recipe calls for green onions but feel free to use any type of onion you have on hand. Spicy and delicious, these jalapeño-chicken quesadillas are the perfect appetizer for game day. Seafood lovers will dive right in to these. Caramelized sweet onions and smoked gouda cheese elevate this simple quesadilla into a delicious appetizer. Green chiles add a subtle spice. Melted cheddar cheese and barbecue chicken stuffed into a crispy quesadilla is a great weekend lunch. Warm mushrooms and crisp bacon are a perfect pairing. Healthy and vegetarian, this quesadilla is made with vitamin-rich carrot and leek mixture, cheddar cheese, Sriracha and honey. Curried potatoes add an Indian twist. Spicy Sriracha-spiked chicken and lots of grated cheddar cheese make these a party favorite. This is a meal in itself, stuffed with cooked quinoa, chicken and melted cheese. Adding fresh zucchini to a cheesy quesadilla livens it up a bit; the bold, spicy salsa gives it an excellent punch. Healthy and delicious sautéed kale is the star in this simple recipe. The classic combination of broccoli and cheese makes its way into a quesadilla to create a delicious vegetarian snack. Tim Love overstuffs his quesadillas with delectable braised pork and sautéed onions and peppers, then goes (almost) over the top by smearing the tortillas with soft, tangy goat cheese. Even onion haters will love the rich and sweet caramelized onions in this recipe. This fajita-quesadilla mash-up is sure to be a crowd pleaser. Double the cheese and you double the goodness. Zesty red onions are fantastic in this classic cheesy chicken quesadilla recipe.